Several months ago, we began the process of raising funds to eventually dig a borehole that would provide water for farming, cooking, cleaning and caring for our students and livestock. We anticipated it would take many months to raise these funds, and many more months before the well could be completed. We have once again been thrilled and amazed at God’s provision for these young men. Through the loving gifts of many donors who have entrusted us to provide the resources for this training center, the funds were raised in one night. All of it. But the provision didn’t end there. Early research into the cost of drilling and to the location the well should be located brought us to a company named Drilling for Life. Their heart for what is being done at Seeds of Hope in Naivasha led them to help us by absorbing a significant portion of the costs to drill the borehole. Not only that, but they were onsite in less than a week following their visit to the center to begin their work. The borehole has been drilled. They are in the process of capping the hole and will soon provide the storage tower and solar powered pump to draw water to the entire facility. We are so blessed to have them on board, and to have the continued loving support of our contributors for not only this project, but for all that has been accomplished in the last year at Seeds of Hope Vocational Training Center. Do you buy from Amazon? 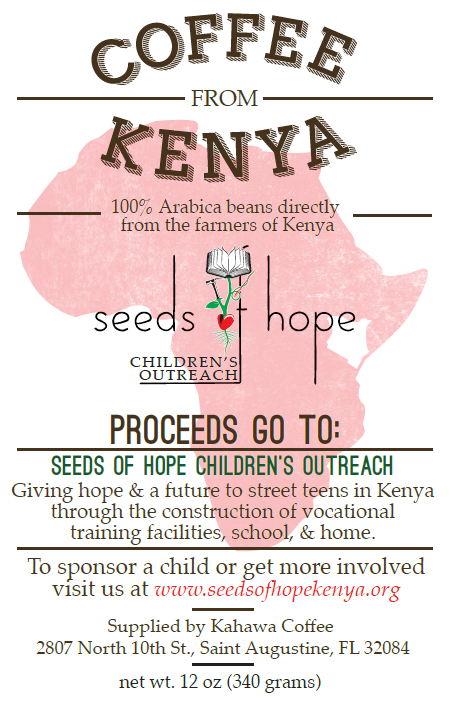 Do you want to help support Seeds of Hope? You can do both at the same time without spending another dime. It’s really simple. Go to Smile.Amazon.com just like you would order from Amazon.com. Go into your Account Settings and click the button to choose a charity. Find and select Seeds of Hope Children’s Outreach and you are done. Every time you make a purchase through Smile.Amazon.com, they will contribute a portion of the proceeds on your behalf. No additional costs are passed to you. This is the easiest way to help Seeds of Hope. Bookmark this site so you always buy through Smile.Amazon.com, and be a contributor every day! Great coffee! Great cause! And a tax deduction! We have a source for hand-picked Kenyan coffee beans, the cream of the crop, and a local (Temecula, California) roaster that roasts and vacuum packages the coffee. The purveyor of this coffee is intimately involved in non-profit orphanages in Kenya and provides this to us at cost. We then resell the coffee, with all profits going to our Seeds of Hope Children’s Outreach vocational school for homeless children. Your $14, 12 ounce whole bean or ground coffee purchase provides over $8 in contribution to our 501c3 charity for which you may be able to claim for a tax deduction as well! Seeds of Hope Children’s Outreach is part of the American Express giving family! American Express has a giving heart. Each year, worthy 501c3 charities are chosen for their Give2gether charitable matching program, which is initiated in September and runs through the Holiday season. Inclusion in this program requires nomination from an American Express employee and meeting stringent compliance criteria. The Give2gether program provides a format for the 54,000 American Express employees to give to the approved charities, with AMEX then matching the contributions dollar for dollar. Seeds of Hope Children’s Outreach has also been added to the Members Give program, whereby all American Express customers may donate using their American Express cards via the American Express website. Accrued benefit points can also be allocated for donation.